Giveaway and Guest Blog for Darcy vs. Bennet! 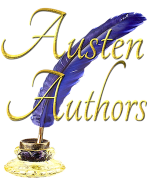 Ceri is hosting me today at Babblings of a Bookworm for a guest post and excerpt from Darcy vs. Bennet– and a giveaway! Check it out. ← Darcy vs. Bennet #25 on Amazon’s Regency Romance Bestsellers List!